Before the war, plans had been made to handle air raids. 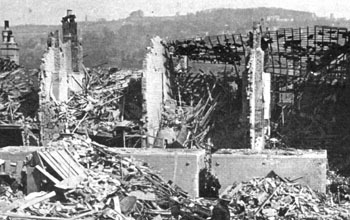 Bath City Council, as early as 1935, had set up a Civil Defence Committee to plan civil defence. Later, the Government, with the issue of Home Office Circular No. 57/1939 in 21st March 1939, had placed the responsibility for implementing these plans onto local councils. 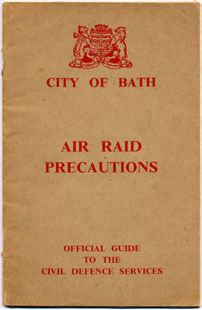 Bath City Council then set up an Emergency Committee to take control of Civil Defence on the declaration of a National Emergency, and produced a booklet for the residents of Bath to explain the arrangements and procedures. When war was announced, these Air Raid Precautions schemes were implemented. Air raid sirens were tested (there were 11 at different sites around the city) and gas masks were issued. Offices were set up for issuing Identity Cards and Ration Books. Everyone had to register with specific shops where they would buy their rationed goods. All street lights were turned off and all windows and doors were fitted with blackout curtains, so that no lights would be visible to any bombers overhead. To assist those walking in the darkened streets, roadside trees, lamp posts and kerb stones were painted with white stripes. First Aid centres were set up and equipped. 18 First Aid Points were set up to deal with simple First Aid and minor injuries. Those to be treated at these points were expected to be able to get there themselves. 4 First Aid Posts were set up, staffed by a doctor, at least one other medically qualified person, and with facilities for treating patients affected by gas. Ambulances were expected to deliver patients to First Aid Posts if they were not so seriously injured that they had to go to hospital. 5 First Aid Depots were set up. These were the bases from which 32 Ambulances and 47 First Aid cars operated. 18 First Aid Parties, each consisting of a driver and four people fully trained in First Aid were based at these depots. Rest Centres were set up, mostly in churches and schools, and these were provided with food stocks, blankets and emergency lighting, so that anybody whose home was bombed had somewhere dry and warm nearby to go to. 18 centres were fully equipped; 3 were equipped only for food. These centres could provide accommodation for a total of 2730 people, and meals for an additional 345 people. A further 28 centres were designated as supplementary Rest Centres, to be equipped and brought into use only if needed. Five veterinary practices were nominated to provide temporary accommodation for stray pets. Apart from the Rest Centres, which were intended to be used by those made homeless by bombing, the possibility that those whose homes were still habitable might need to be fed was also covered. Anybody who could not cook at home because of the failure of water, gas or electricity supplied could go to one of 27 Emergency Feeding Centres, where simple uncooked food with a hot drink would be provided for breakfast or tea, and a hot meal could be obtained for lunch. These were provided for a small charge. The Emergency Feeding Centres were mostly set up in school canteens, but four were in business premises and were for use by the employees only. The Peoples Dispensary for Sick Animals offered emergency supplies of pet food for those whose household stocks were destroyed by bombing. When I was told that a garden in Bathwick still had its wartime Shelter, I went along with my camera and took some photos. It is a concrete and brick shelter..
As part of the preparations for war, the citizens of Bath were advised about sheltering from any bombing that might happen. Where people could shelter in their own homes, they were expected to do so. Two types of personal shelter (described below) were obtainable on request. Although these "official" shelters were available, Bath was not considered to be a likely target for bombers, and many residents opted to shelter in protected parts of their house, such as the cellar (if they had one) or the cupboard under the stairs. Sir John Anderson was Minister of Home Security until October 1939, and it was his responsibility to design suitable precautions against air raids. He described a type of metal underground shelter. It is often thought that the resulting tunnel-shaped shelter of corrugated iron sheets bolted together was named after Sir John, but it was actually named after it's inventor, Dr David A Anderson, who had the same surname but was no relation. 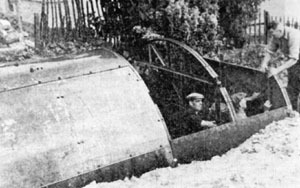 The Anderson shelter was an outdoor, tunnel-shaped steel shelter, 10 feet (3 metres) long and 4 feet (1.2 metres) wide, which was intended to be sunk into the ground and covered in earth to a minimum depth of 15 inches (40cm). The picture below shows an Anderson shelter being constructed in Fairfield Park. (The particular shelter in the photograph was going to be a Warden's Shelter rather than one for the general public, but it shows how the shelter was constructed). This type of shelter was designed to sleep 6 adults with little room to spare, but usually it was large enough to hold a larger family provided they did not lie down. Some families fitted out their shelter with a small amount of furniture, books to read, and some form of lighting and heating to make them reasonably comfortable. The drawback with the Anderson shelter was the effort needed to dig the hole to erect it in, and it had a tendency to become very damp in wet weather. Nevertheless, properly constructed and covered with the recommended thickness of earth, it would survive anything apart from a direct hit. One bomb landed in a garden in Bath, only a yard away from an Anderson shelter. None of the 5 people in the shelter were hurt. The Anderson shelter was supplied free of charge to those with a low income, and at a charge of £7 for everybody else. Nearly two and a half million Anderson shelters were supplied across the whole of Britain. About a quarter of British households had one. But for those without gardens, it was not suitable. The Morrison shelter was named after Herbert Morrison, who became Minister of Home Security in October 1939. Not everybody had sufficient garden to accommodate an Anderson Shelter, so by early 1941 an indoor shelter had been designed and made available. The Morrison Shelter was designed for use indoors. When covered with a table cloth, it looked like a dining table, and its height of 2 feet 9 inches (84cm) was chosen so that it could be used as one. 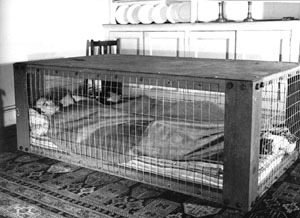 It had a strong steel top supported on sturdy steel legs, with wire mesh sides that could be unclipped so that members of the family could crawl in. The completed shelter was too heavy to move, so it had to be assembled in the position in which it was to remain. The Morrison Shelter had the advantage of protecting its occupants from falling masonry while offering the warmth of the house. Its drawback was that the wire mesh sides provided little protection from blast. It was also uncomfortable if several people crammed into the one shelter. The Morrison shelter was supplied free of charge to most people who wanted one. Over half a million were distributed across Britain in 1941 alone. The Air Raid Precautions recognised that many people would be away from their home when an air raid took place. Public shelters were provided, which people could use if necessary. Visitors to the city were also expected to use public shelters. Various types of public shelter were provided. Trench Shelters were constructed underground, like very large Anderson shelters. 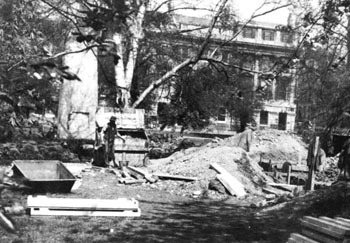 The picture shows the one in Queen Square being dug out. One of the residents of Princes Street remembers sheltering there during the first night of the bombing. The entrance was opposite No. 4 Queen Square. Similar shelters were dug in other grassy areas: Sydney Gardens, Alexandra Park, Twerton Roundhill, The Oval, Rudmore Park, Lower Common (part of Victoria Park), Hedgemead Park, Innox Park, Fosseway Estate and Larkhall Recreation Ground. There were some slight variations in size, but typically, each Trench Shelter could hold 150 people. Numerous residential streets were provided with brick and concrete shelters at the side of the road, allowing neighbours to shelter together. 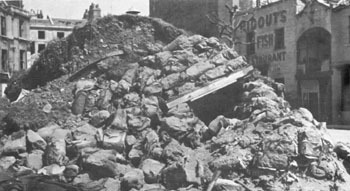 The photograph shows such Street Shelters, on this occasion amid the ruins of the dwellings in Victoria Road. Many other Street Shelters survived the bombs that wrecked the houses around them in other streets. Street Shelters could not survive a direct hit (and unfortunately a few did suffer that fate), but they saved many lives from shrapnel and falling masonry. In the case of Victoria Road, although every house in the street was badly damaged, nobody in those shelters was injured. Some were constructed in steel, rather like an Anderson shelter but erected on a solid surface, and then covered in sandbags to provide added protection. Typically, such shelters could accommodate up to 50 people. The picture shows the one in James Street West, tilted slightly sideways by a bomb which exploded nearby, but it saved the lives of everybody inside it. There were 18 Steel Shelters erected around the city, all of similar size. Some shelters were made by reinforcing the underground structures of existing buildings, such as church crypts and Georgian vaults. 22 such shelters were created, and some were surprisingly large. Typically, a converted church crypt would hold 150 to 200 people, and Georgian vaults around 300. The largest of the Georgian vaults, in North Parade, could accommodate over 800. The city was divided into 12 areas of responsibility, each managed by a Head Warden. Each Head Warden set up one or more Group Posts, permanently manned and fitted with telephone and equipment (There is a picture above of the post at Fairfield Park being constructed). Reporting to the Head Warden were a number of Senior Wardens, each with responsibility for about 500 people. Senior Wardens were supported by 5 Wardens. Thus each warden looked after about 100 people. As well as advising residents in the event of an attack and reporting details of attacks to control points, the Wardens' Service also had the responsibility for enforcing the black-out, organising the fire watches and alerting residents of any gas hazards. 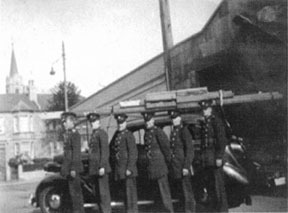 One of the main considerations when dealing with fires in wartime was that the Fire Service should always be able to get to a fire. If a fire station was hit by a bomb, there had to be other fire stations that could respond. If roads from one direction were blocked, there had to be other fire stations that could respond from a different direction. Thus the Fire Service was divided into five companies, each with its own fire station (except the North Company which had two). The equipment was not new, but it was well maintained and fully serviceable. The fire engine pictured right, photographed at its station on the Lower Bristol Road near Windsor Bridge, is fairly typical. It was equipped with a ladder and a pump that could pump 350 gallons (1600 litres) a minute. It did not carry water though. The picture on the left, taken at the Bear Flat fire station, shows a car converted into a fire engine by mounting ladders on the roof. When called out, it would also tow a trailer pump behind. These simple facilities would typically be manned by volunteers or part time firemen. 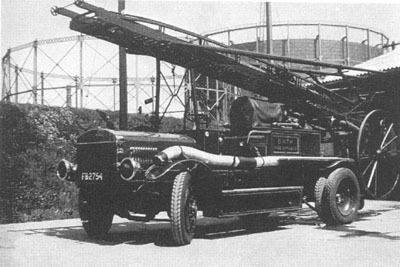 The picture on the right shows a Mobile Unit, known by the Fire Service as a "Dam". It consisted of a lorry borrowed from a local business (the one pictured used to carry fruit), fitted with a waterproofed canvas water tank holding 500 or 1000 gallons (2250 or 4500 litres) depending on the size of lorry, connected to a pump towed behind. This equipment could be deployed quickly because it did not have to find a water supply to connect to, and thus could prevent a small fire turning into a big fire. The other type of equipment was known as a Fire Float. These were large capacity (700 gallons or 3200 litres a minute) pumps, mounted on boats on the river. One was moored at Windsor Bridge, one at Pulteney Bridge and one at Old Bridge. Through long hoses and using relay pumps if necessary, the river could provide an almost unlimited water supply to most of the city, should the mains be damaged. It was assumed that water mains might be damaged by bombing, and other water supplies would be needed in that event. Ponds, lakes, springs, public baths, swimming pools and stored water for businesses like laundries and plant nurseries were assessed for quantities available. New storage tanks were installed at numerous points around the city. Four emergency mortuaries were set up. Three were in churches, the fourth in railway arches.